just because someone tells you the government is lying to you, it doesn't mean they are telling the truth. Binary thinking is a mind cancer that retards insight, and unfortunately flourishes in conspiracy culture. "The beginning of wisdom," said Terrence McKenna, "is our ability to accept an inherent messiness in our explanation of what's going on." But popular conspiratology is a pathological neat freak that abhors disorder and complication, which is why it can never rise above the level of entertainment and become an agent of change and justice. It's not meant to. And so it thrives. Two sides to every issue? Truth seeking is a two front effort. 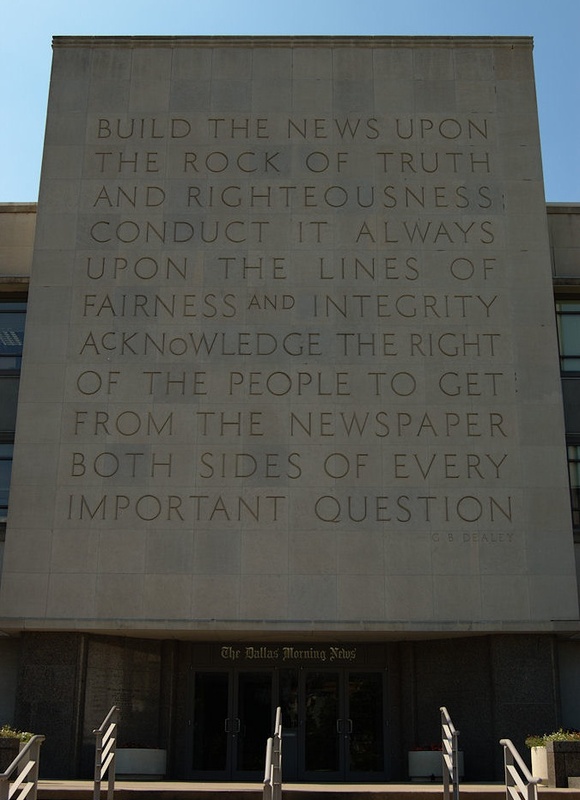 "Both Sides" photo of the entrance of Dallas Morning News, quoting George Dealey, publisher of the newspaper. Dealey Plaza, where President Kennedy was killed, a few blocks away, was named after him. The Bush administration states that everyone on Earth must choose between supporting their policies or supporting Islamic terrorism, when nearly all of the world rejects both. A peaceful approach compatible with the survival of civilization cannot support either the War on Terror nor the Iraqi insurgency, neither the US occupation of Afghan poppy fields nor the Taliban. Establishment politics in the United States of America seeks to confine discourse toward whether one supports the Republicans or the Democrats even though there is a much more diverse range of opinions. While the two parties differ on some social policies, they are nearly identical on the core issues of expansionist empire (even though the Republicans are usually worse). Some in the Democratic Party imply that if you support a stronger role for women in politics you have to support Hillary Clinton, even though many feminists (female and male) are repulsed by her shilling for corporate polluters and efforts to further shred the social safety net. Margaret Thatcher's terms as Prime Minister in England proves that gender does not determine policies. The mainstream view of environmentalism suggests that those concerned about pollution changing the climate should embrace Al Gore's non-electoral political campaign, even though he helped make the climate crisis worse while Vice President. And some far-right wing anti-environmental voices suggest that because Al Gore has some unpleasant politics, therefore climate change is a hoax -- as if atmospheric chemistry was dependent upon a particular politician or political entity. Some media propagandists also claim the energy choices in the climate change era are between allegedly "cleaner" coal or an expansion of nuclear power, even though the energy that would be invested to increase these toxic technologies would be more effectively used for efficiency, relocalization and renewable energy systems. Some anti-environmental propagandists and a few liberal journalists imply that Peak Oil is a contrived concern, created to justify oil company profiteering. While oil companies are certainly making astronomic profits from increased petroleum prices, it does not mean that fossil fuels are infinite. Those voices who try to debunk Peak Oil either claim that unconventional oil (such as tar sands, which take almost as much energy to process as they contain) will replace depleting oil fields, or worse, that oil is supposedly regenerated naturally from the Earth ("abiotic oil") and therefore we will not have any limits to oil dependent growth. Pundits who merely complain about petroleum profits rarely suggest nationalization of these corporations, diverting excessive profits to improve Amtrak, conservation or renewable energy. Most corporate media stories about the technology of food irradiation have included the disclaimer that nuclear radiation exposed foods do not become radioactive, therefore it is a safe processing technique. Irradiation critics do not claim it induces radioactivity, focusing instead on the fact that intense gamma rays change food chemistry, destroying vitamins and creating new, toxic compounds. The loudest voices in 2007 in support of the paradigm that the Bush administration was complicit in 9/11 argue for "no planes" (the plane crashes were faked, or substitute planes were used). The debunkers in the media accurately point out that these no plane claims are nonsense, but then claim that because this claim is false, therefore there was no official conspiracy to permit the attacks to happen. Few on either side mention the well documented evidence that there was complete foreknowledge at the highest levels of the administration. Within the 9/11 truth movement, there is a false dichotomy between whether 9/11 was LIHOP - Let it Happen on Purpose or MIHOP - Made it Happen on Purpose. This LIHOP / MIHOP debate was apparently created by a fringe member of the truth movement who vociferously claims that none of the plane crashes happened. This divisiveness keeps government critics from uniting and obscures the obvious: if there was a deliberate effort to allow the attacks to happen, then efforts would have been made to ensure that they happened as desired while avoiding outcomes that would not be mitigable (if the first planes hit Indian Point nuclear power station north of New York or the National Military Command Center in the Pentagon). The powers-that-be knew 9/11 was coming for years (a previous effort was stopped in 1995), and had numerous intelligence warnings before the attacks. FBI efforts to investigate the flight schools before 9/11 were thwarted by senior management. It is likely the hijackers were allowed to complete their preparations and hijack the planes but then the "auto land" uninterruptible autopilot was used to "hijack the hijackers" (a double cross?). Zionists and extreme anti-Semites each tell their supporters that they can only support Israeli apartheid or Holocaust denial, and that the presence of the other is a reason to support them. However, within Israel there is a much broader range of opinions about the morality of Israeli policies than within American politics, although most American Jews do not support the Likud (ultra militarist) faction in Israel. We don't need neo-Nazis to tell us that Israel violates human rights. It is possible that some of the Holocaust deniers are provocateurs intended to give uncritical supporters of Israel an excuse to avoid examining human rights abuses against Palestinians, among other contemporary crimes. The issue of Israeli involvement in US politics also polarizes fake debates. Some people correctly point out the incredibly biased tilt of the oil empire toward uncritical support for Israel's military policies, which is counterproductive for both the United States and Israel. Other people, who are often part of the foreign policy and political establishment, deny this and suggest that Israel has minimal influence. In reality, both points of view have some truths. Israel is in a mutually destructive alliance with the United States, but Israel is also the tail to the American dog (and the tail does not wag that dog). If Israel did not exist, the US policy in the Middle East, especially in the oil fields, would probably not be much different, since the US has demanded control over the oil for decades. Israel is a factor in the US invasion of Iraq, but the primary reason for is Peak Oil. If Israel was the primary motivation behind US Middle East policy, Bush would have invaded Syria first instead of Iraq (since Syria is more directly a military confronter of Israel). This perspective should not be misinterpreted as support for Israeli militarism, US imperialism, or even anti-Semitism -- although it is likely that some shills will attempt to misrepresent it this way. Discussion in the United States about the atomic bombing of Hiroshima and Nagasaki pretends that the only choice facing President Truman in 1945 was either to use nuclear weapons on cities or to suffer countless American casualties in a protracted invasion of Japan. In reality, the Japanese military had already sent diplomatic statements that a surrender was desired (Japan was starving, with most of its cities destroyed and its oil supplies completely cut off). However, they had one precondition -- the Emperor should be left as a spiritual leader of the country. These initiatives were rejected by the United States, saying unconditional surrender was required. Japan's Emperor was allowed to retain his ceremonial position after the war, so the crimes of Hiroshima and Nagasaki - the largest simultaneous slaughters in human history - were not needed to stop World War II. Instead, they were the first volleys of World War III. Robert Mugabe, the dictator of Zimbabwe, claims that critics of his policy want to reimpose white European control over Africa, even though many of his critics are Africans who oppose imperialism. Right brain? Left brain? Both halves of the brain are needed. Perhaps the most controversial fake debate is between religion and spirituality -- religious myths, ritual and dogma is often a distraction from deep spirituality. It is likely that many peoples intuitively sense a fundamental reality to spiritual energies (some of them, anyway) but confuse these energy patterns with their particular flavor of religion. Since the core parts of nearly every religious tradition are extremely similar, moving beyond religious factionalism toward an omnispiritual awareness of the unity of the universe is part of the change of consciousness needed for our survival and evolution beyond war. .... Signs in the crowd displayed a range of messages, including one reading: "We refuse to choose between Islamic fundamentalism and American imperialism." .... We condemn Western double standards, duplicity and hypocrisy. For example, while we appreciate Western pronouncements on the democratic deficit in Zimbabwe we condemn the democratic exemption they extend to Pakistan, Saudi Arabia and Kuwait. There is need for consistency if the West is to be effective in its support for democratic and progressive movements. We note that when we in Mozambique, Zimbabwe and South Africa were fighting for our freedom we received no arms of war from Britain and the USA. Why did they not provide weapons to the FRELIMO, ZIPRA and ZANLA, MK and APLA freedom fighters and yet they found it appropriate to arm and support Mobutu Seseko, Jonas Savimbi, Saddam Hussein (in his war against Iran) and Osama Bin Laden (in his skirmishes with the Soviets in Afghanistan)? This begs the question what really informs Western foreign policy? It seems permanent interests outweigh both permanent values and principles. We stand viciously opposed to these double standards. .... By framing issues in terms of: Are you for land reform or not? Are you for or against white farmers? Are you for or against colonialism? Are you for Africans or the colonialists? President Mugabe has posed in a more sophisticated way; the rhetorical statement so crudely articulated by George Bush that it eventually backfired - "you are either with us or with the enemy". Such "you are with us, or with the enemy" rhetoric regardless of the cause which claims to serve, its sophistication or crudeness is dangerous to human rights, to social justice and ultimately to Africa's development because it suggests that anything can be done in the name of defending 'us' against the alleged 'enemy' or even worse, that anything can be done to alleged 'enemies' in the name of defending 'us'. It also suggests that no wrong can be done in the name of fighting the alleged 'enemy' and ultimately that anything but unquestioning loyalty is betrayal. Yes, we must raise our voices. Up to this point, I have refrained from appealing to emotion. We are being torn apart by a logic of history which we have elaborated in every detail--a net which threatens to strangle us. It is not emotion which can cut through the web of a logic which has gone to irrational lengths, but only reason which can meet logic on its own ground. But I should not want to leave the impression... that any program for the future can get along without our powers of love and indignation. I am well aware that it takes a powerful prime mover to get men into motion and that it is hard to throw one's self into a struggle whose objectives are so modest and where hope has only a rational basis-- and hardly even that. But the problem is not how to carry men away; it is essential, on the contrary, that they not be carried away but rather that they be made to understand clearly what they are doing. To save what can be saved so as to open up some kind of future--that is the prime mover, the passion and the sacrifice that is required. It demands only that we reflect and then decide, clearly, whether humanity's lot must be made still more miserable in order to achieve far-off and shadowy ends, whether we should accept a world bristling with arms where brother kills brother; or whether, on the contrary, we should avoid bloodshed and misery as much as possible so that we give a chance for survival to later generations better equipped than we are. For my part, I am fairly sure that I have made the choice. And, having chosen, I think that I must speak out, that I must state that I will never again be one of those, whoever they be, who compromise with murder, and that I must take the consequences of such a decision. The thing is done, and that is as far as I can go at present.... However, I want to make clear the spirit in which this article is written. We are asked to love or to hate such and such a country and such and such a people. But some of us feel too strongly our common humanity to make such a choice. Those who really love the Russian people, in gratitude for what they have never ceased to be--that world leaven which Tolstoy and Gorky speak of--do not wish for them success in power politics, but rather want to spare them, after the ordeals of the past, a new and even more terrible bloodletting. So, too, with the American people, and with the peoples of unhappy Europe. This is the kind of elementary truth we are likely to forget amidst the furious passions of our time. All I ask is that, in the midst of a murderous world, we agree to reflect on murder and to make a choice. After that, we can distinguish those who accept the consequences of being murderers themselves or the accomplices of murderers, and those who refuse to do so with all their force and being. Since this terrible dividing line does actually exist, it will be a gain if it be clearly marked. Over the expanse of five continents throughout the coming years an endless strugle is going to be pursued between violence and friendly persuasion, a struggle in which, granted, the former has a thousand times the chances of success than that of the latter. But I have always held that, if he who bases his hopes on human nature is a fool, he who gives up in the face of circumstances is a coward. And henceforth, the only honorable course will be to stake everything on a formidable gamble: that words are more powerful than munitions.